For businesses, 2017 is a year of easy money, thanks to a demonetisation powered surge in cash with banks that kept interest rates low. However, this is going to change. Now, there are clear signs that liquidity is reducing in the banking system and interest rates are set to rise. RBI was forced to lend money to banks last week for the first time since demonetization. The drop in liquidity in the system is a fall out of advance tax outflows from banks, resulting into a cash squeeze. This was not a problem in the first three quarters of 2017 as demonetization had pushed up cash level in banks. The systemic liquidity deficit — triggered by advance tax payments for Q3 FY2018 and recent increase in credit offtake — to widen with GST payments. As a result of the squeeze in liquidity, yields on the 10-year government bonds rose to 7.25%. Long term home loans are available at 8.35%. This is the narrowest spread between the 10-year G-secs and home loans in recent times. The 10-year yield had dropped to 6.2% a year earlier. Another reason for the cash shortage is currency in circulation continues to rise, defying RBI’s claims that it has stabilized. CIC rose to Rs.16.9 lakh crore for the fortnight ended December 15, 2017, up from Rs.16.8 lakh crore in the previous one. This has been rising fortnight upon fortnight and is now at the same level as March 2016. 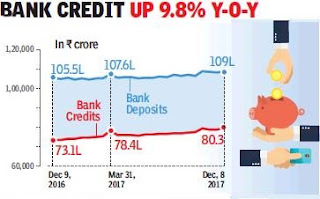 Economists are now saying that CIC level is keeping with long-term trend lines and demonetization is turning to be a blip. The rise in bank loans is another indicator that interest rates will come under pressure. According to RBI data, outstanding bank credit as on December 8, 2017 stood at Rs.80.3 lakh crore — a year-on-year increase of 9.8%. This is a sharp jump from the 5% level at the beginning of the year and highest since October 2016. Besides rising demand from corporates, the government is also expected to increase its borrowing. There are expectations that the government may raise farm spending during the current financial year after weaker than expected performance in Gujarat state elections. In its forecast for 2018, Standard Chartered Bank has said that it expects the government to deviate from the fiscal consolidation path and borrow more than planned.